Drive safe, did I read you will be at Expo East? Yes, I'm on the way there right now, spent last night in Denver. 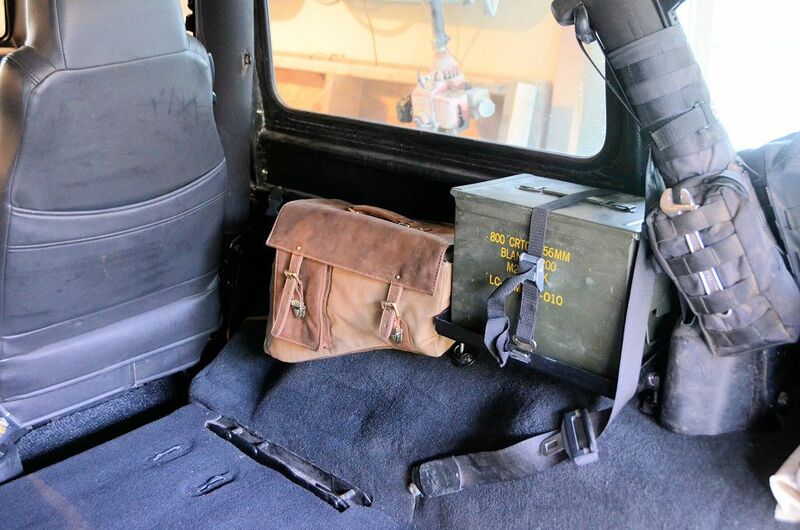 MORryde is using my Jeep in their booth at Expo, also they'll have Joel's Retrofit Offroad Jeep in their booth. 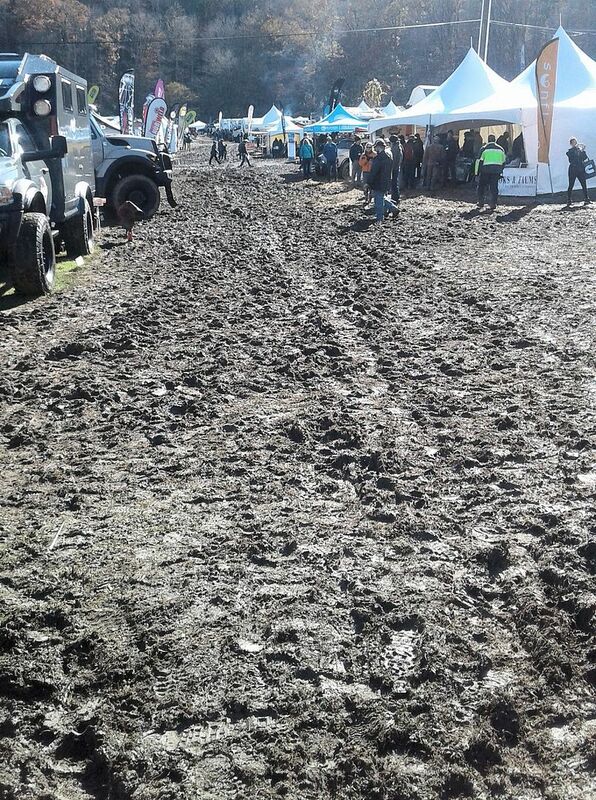 Rain is forecast for the first day of the show, ugh. 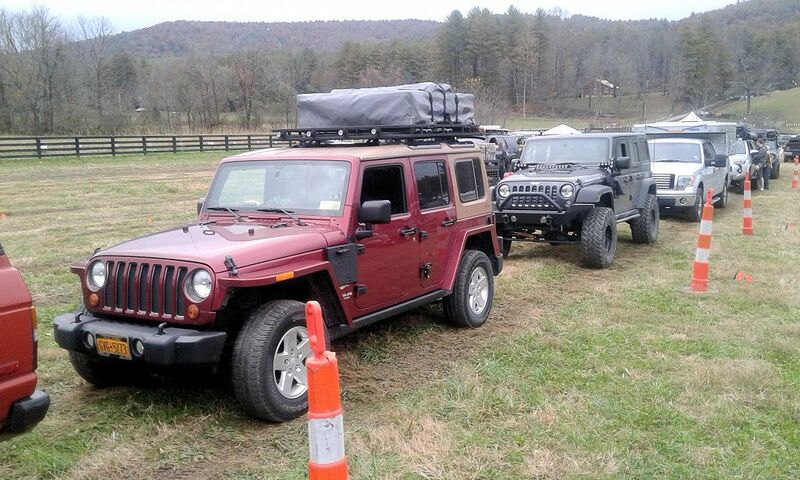 Waiting in the hour-long line to check the Jeep into the vendor area at Overland East yesterday. The Jeep right behind mine belongs to Joel at Retrofit Offroad, they're sharing the booth with MORryde. We saw your Jeep in downtown Hendersonville last night. Perry Mack, editor of 4WDrive Magazine (Canada) posted this photo in his SEMA recap. This was taken while he was doing a video of the Trail Kitchen at the show. I don't think he's posted the video yet, I'll post the link when I see it. 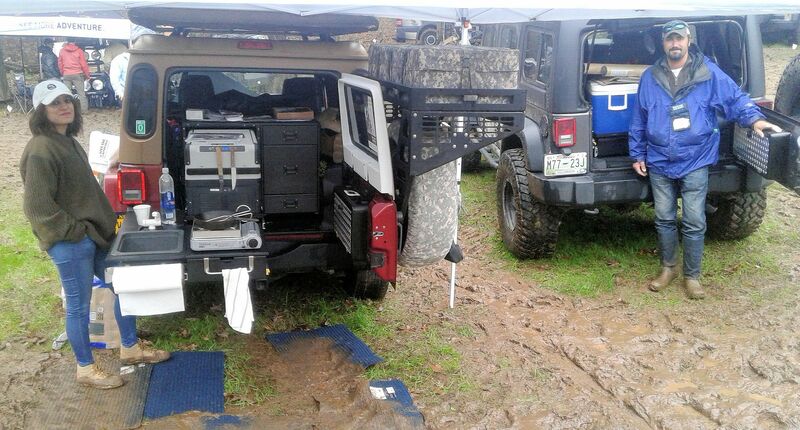 Joel Bane of Retrofit Offroad was sharing the MORryde space, here's a view of my Jeep and his; both have Trail Kitchens in them. Joel's kitchen is the base kitchen outfitted with a cooler, mine has all the production and soon-to-come options and a fridge. Joel, who at one point in his career owned a landscaping business, put his skills to good use today, in this photo he's using the boots MORryde bought us at Walmart this morning to make a drainage channel through the mud. It worked very well! 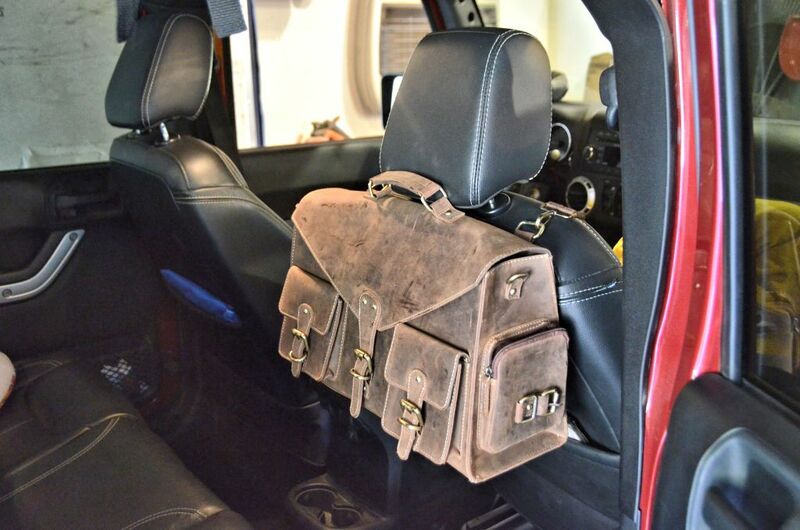 Also in the show with us were several people from Overland Outfitters, which is the startup I've written about - they're doing the leather and high-style canvas bags for storage in the Jeep. 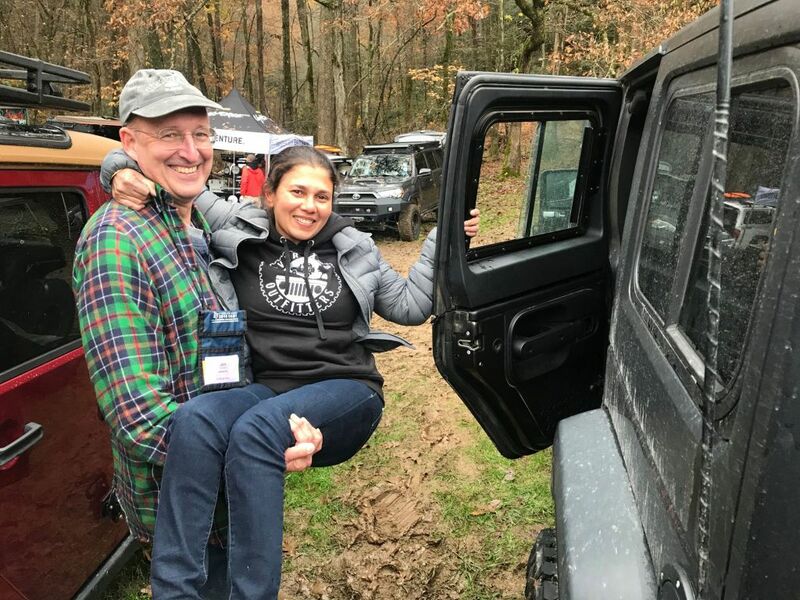 They didn't bring footwear that was up to the task of walking through the thick mud, so I had to give one of them a lift from the Jeep to a place with less mud. The other person in the photo of the two Jeeps above is also with Overland Outfitters. We're hoping for a less miserable day tomorrow. I think Joel is envious of the barn door. Hmmm, he hasn't asked for one . I may be molding one for another friend though, if I do I'll post about the project here. Thanks for posting the mud video, the Wal Mart rubber boots saved me! Great meeting you today, thanks for all the excellent posts on this thread. Rain is forecast for the first day of the show, ugh. Great meeting you too! 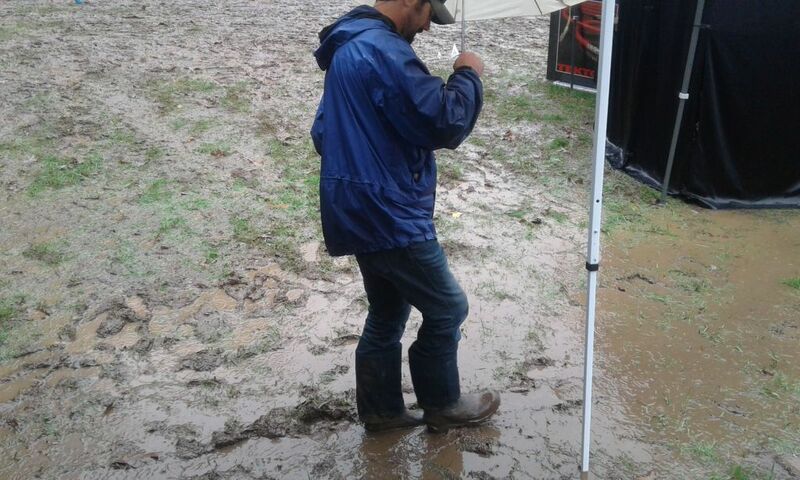 Really couldn't survive this year's event without the Walmart boots . And once the frost melted, the "attack mud" was vicious. Took this photo about mid-day, take a look at the guy in the blue jacket in front of the woman in orange - you can't see his left foot because its planted in mud about 6" deep. 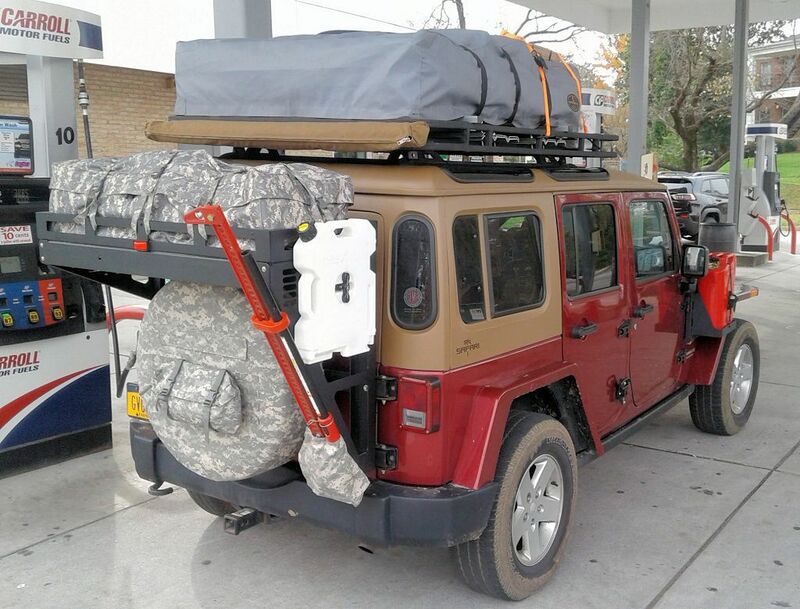 Had a very packed Jeep on the way back, I picked up an extra passenger for the trip so there were three of us, all of whom had luggage for over two weeks, plus the full Trail Kitchen, roof-top tent and lots of other things acquired along the way. 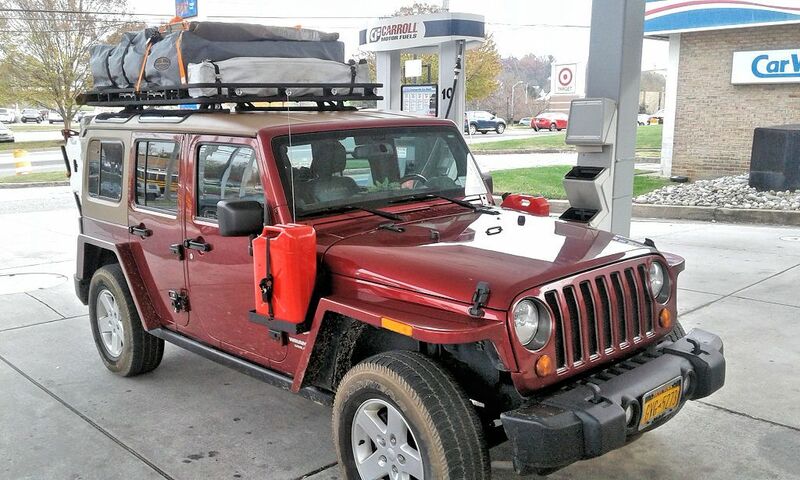 The thin cardboard box on top of the tent held on with orange straps is a brand-new JK tailgate I found on Craigslist along the way for $100. I've got several tailgate projects coming up so having an extra one for the workshop will make the projects easier than running out to the Jeep to test-fit everything. And in this photo I've loaded the Overland Rack bag with about 40 pounds of luggage. 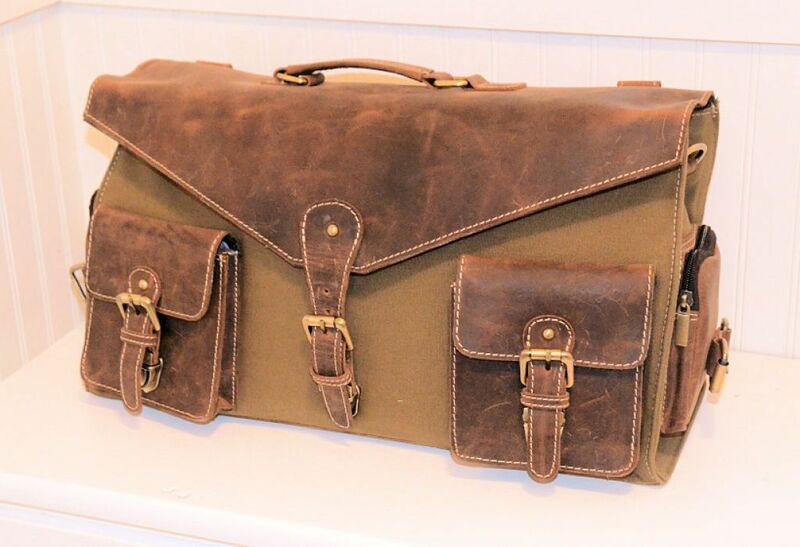 The bag worked out great and Overland Outfitters plans to do a production version of it in several sizes. Mail waiting at home included several products sent to me to test and review, more about them tomorrow. Thanks to everyone who stopped by during the event to say hi, meeting you and talking with you is always the best part of an event like this. 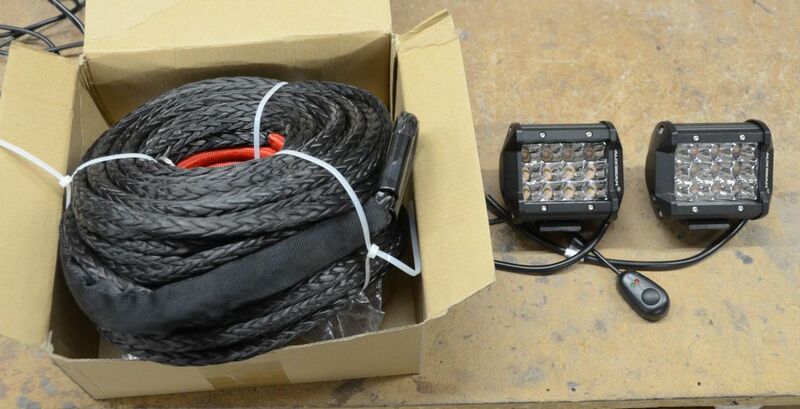 Waiting for me when I got home, a company sent me these to test and review... a set of LED lights that haven't been released yet and a synthetic winch rope. The company asked me to test the lights before they release them to verify the fit of the wiring harness and the operation of the various light functions. I've ordered a smooth aluminum fairlead to swap for my roller one so when that arrives I'll swap the synthetic rope onto my winch and give it a test. I'll do photos and videos of that when I do it. And here's the tailgate I picked up yesterday. It's never been installed but it's been in the guy's garage for a couple of years so there are a few minor dings, but nothing that can't be easily fixed. I've got two projects it'll help with - I need to sew several prototypes of the tailgate storage design I've done for the Overland Outfitters startup, and I've got a new hardware design for "plugging in" various cargo carriers/racks on the outside of the tailgate, including jerry cans, Rotopax, bicycles, etc. My wife and I saw your rig at OE this weekend. 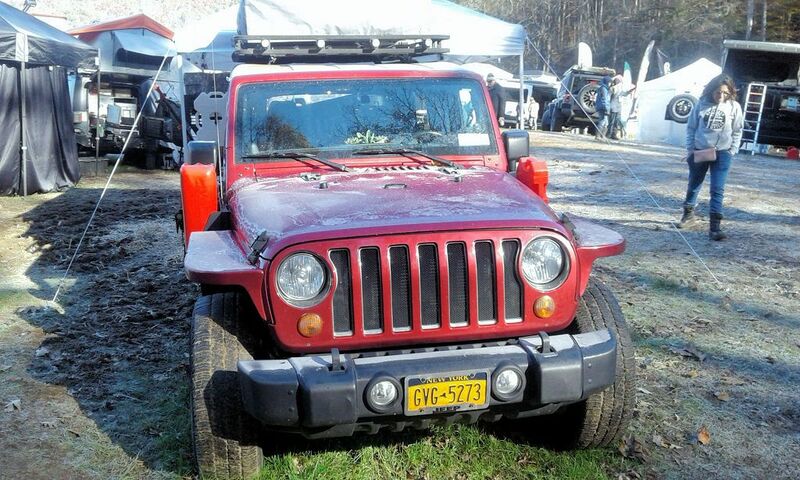 All I’ve heard since Saturday is how much she “needs” the barn door for her JKU. So, thanks for that . I wouldn't ever want to go back to the factory tailgate/liftgate combo. 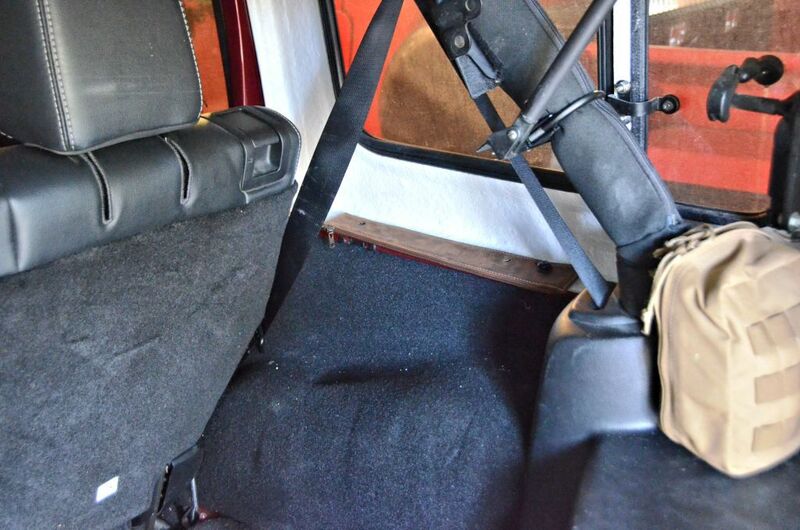 I've had a barn door on my LJ for about 8 years now and for several years now on the JKU, and it really improves access to the cargo area of the Jeep. Especially in foul weather like the first day of the OE event . I'm about to mold a barn door for a friend with an Ursa Minor, I think it'll be a big improvement to his rig as well. Aesthetically, the “safari” top on the LJ isn’t my style, but definitely looks functionality superior to the standard version. 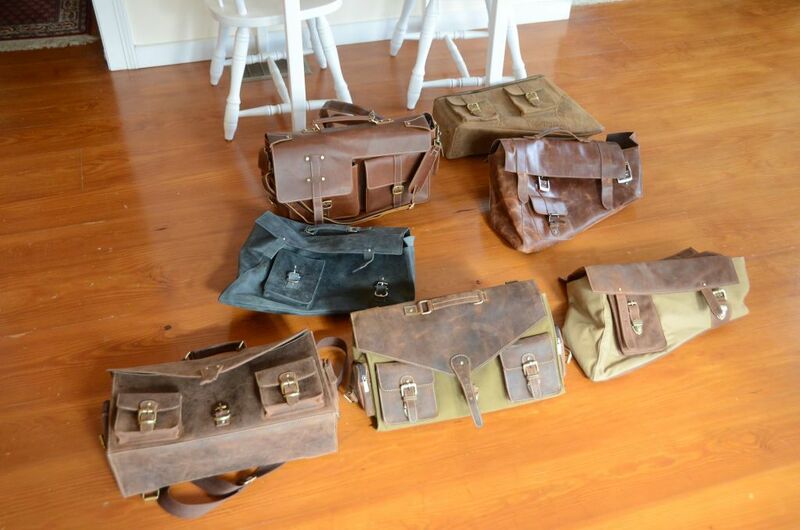 One style I like a lot is their canvas bag design with leather accents. 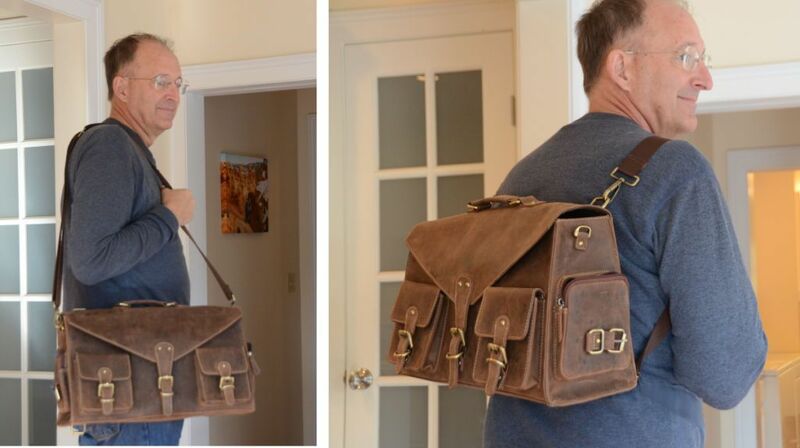 The next two photos show the front and back of a canvas/leather "backpack" bag. 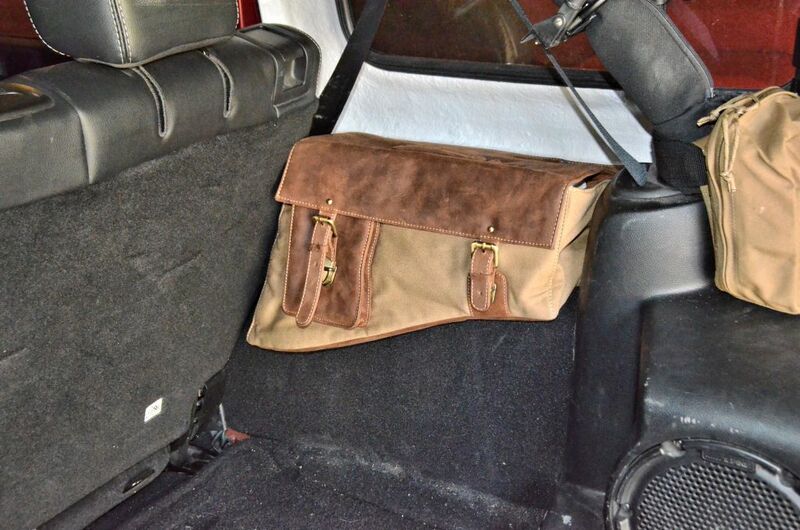 We also worked on the design of the tailgate bag system, I'll be sewing a prototype for them over the next few days. 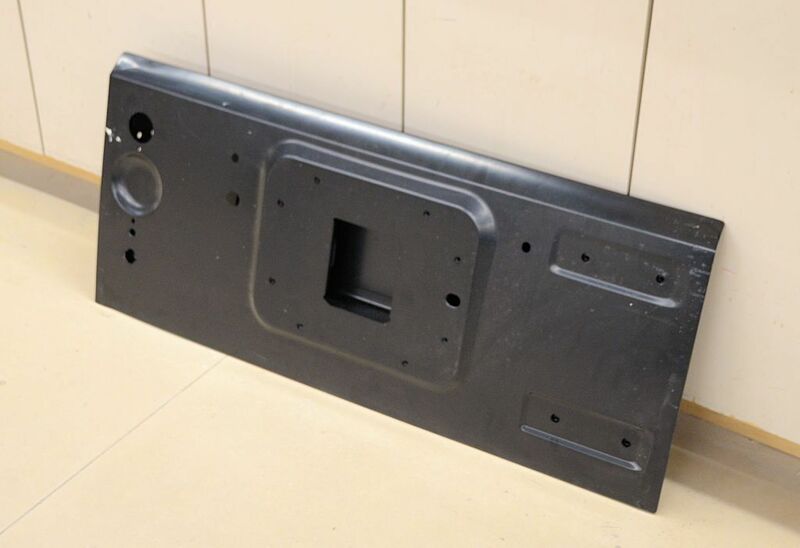 We've worked out a method for mounting on the tailgate that requires no drilling. 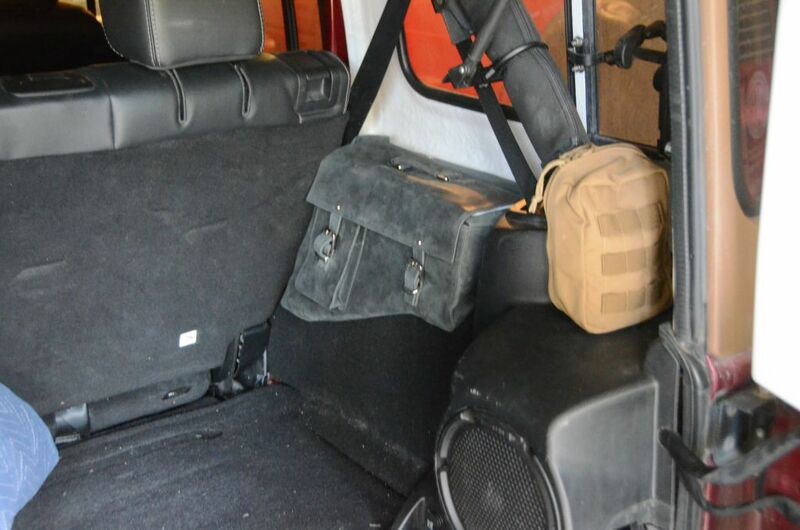 Other tailgate bag systems, like the Smittybilt Gear product, require drilling the tailgate. 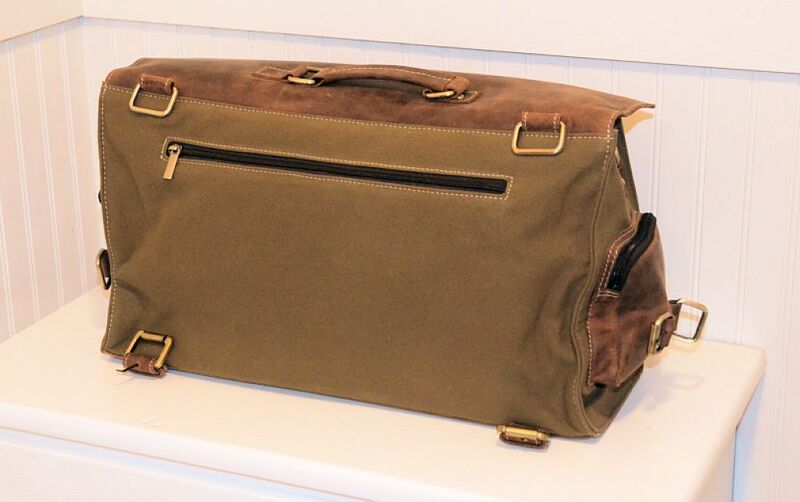 Overall I'm very impressed with the quality and style of the prototype bags and I'm not alone - feedback at SEMA and Overland East was very positive.